Ever wish there was a study room on the first floor so you would be close to the Core materials and Reference Librarians? Well, now there is! 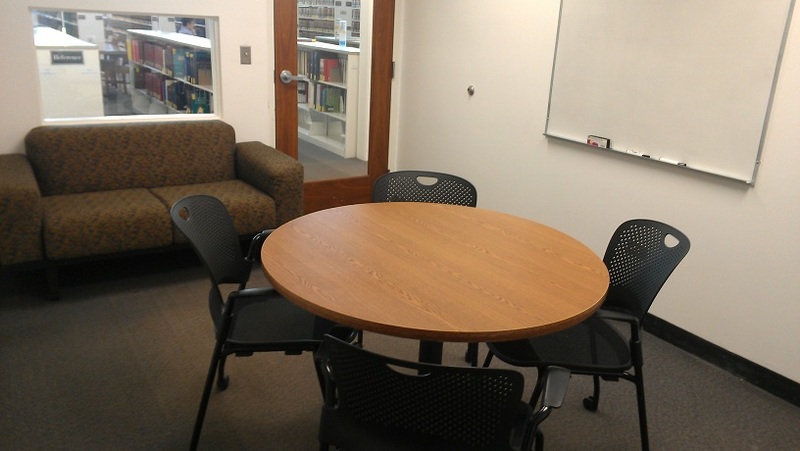 Thanks to some creative repurposing of space and furniture by our staff, the Law Library is proud to bring you our newest 4-person study room. Room 112D is located just past the Reference Librarians’ offices. Like all our study rooms, it is goverend by theStudy Room Code of Conduct and Guidelines, and it can be reserved online up to a week in advance. This entry was posted in Law Library Services, Law Students on February 26, 2013 by Sara Lipich. The West Elevator of the Law Library (the only one that goes to the 3rd floor) is currently out of order. It will be out of commission until tomorrow (Tuesday). We apologize for the inconvenience! We know a few Law Library staffers who will be skipping the Stairmaster at the gym tonight! This entry was posted in Uncategorized on February 18, 2013 by Sara Lipich. Have you signed up for your free Bloomberg Law student account yet? If not, simply go to https://www.bloomberglaw.com/activate and enter your information – no activation code is needed as Bloomberg will authenticate your account with your @asu.edu e-mail address. Bloomberg Law offers access to cases, statutes, and regulations, in addition to news, company and financial data, and docket searching. Bloomberg Law also has all BNA and Practicing Law Institute (PLI) content available in its database, including treatises and BNA reports. Lunch or refreshments will be served at each training. RSVP to Will at wthompson19@bloomberg.net. This entry was posted in Law Students, Legal Research & Writing on February 14, 2013 by Tara. Our Faculty Display Case just got a new addition: the book International Trade in Indigenous Cultural Heritage : Legal and Policy Issues, which features an article by Professor Rebecca Tsosie titled “International Trade in Indigenous Cultural Heritage: An Argument for Indigenous Governance of Cultural Property.” If you’re interested in reading this chapter or the entire book, it is available for check out. This entry was posted in Faculty & Student Publications on February 10, 2013 by Mari Bigler.